M3 micro-mechatronics modules are “all in-one” smart modules, with the controller and position sensor built in to the miniature module. This embedded closed-loop control gives you the smallest size, fastest and simplest integration into your system, and lowest total cost. When the application requires, M3 Smart Modules can also move using open-loop commands from the SPI, I2C or UART interface. This is particularly useful in applications that have an external sensor with better resolution than the internal sensor, or where very fast “step and settle” performance is required. SQUIGGLE® and UTAF piezoelectric motors in the M3 Smart Modules have excellent position resolution: they can move in “sub-steps” of microns or nanometers. However, the motor speed varies with applied load, device friction and other factors. Therefore a closed-loop control system is needed to achieve exact positioning, repeatable positioning, or precise speed. (4) Repeating steps (2) and (3) until the target position is achieved. Similarly, controlled speed is achieved by adjusting the driver gain to minimize the difference between the required position and the actual position at regular time intervals. The driver uses Proportional, Integral and Derivative (PID) controls to actively tune the response of the motor to the feedback signal. These coefficients are interactive and work to keep the motor speed from leading, lagging or oscillating with respect to the sensor feedback signal. Closed-loop stepping provides superior repeatability and accuracy but requires more time to “step and settle” when compared to open-loop stepping. For the M3-RS-U Rotary Smart Stages in the beam steering developers’ kit, the closed-loop stepping resolution is 0.025 degrees (440 microradians) and accuracy is 0.25 degrees (4400 microradians), limited by the resolution of the embedded absolute angle sensor in the module. 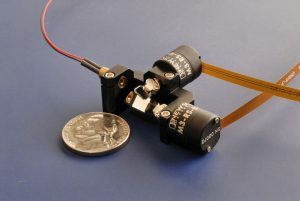 Used open-loop, the stage has a resolution of better than 0.0057 degrees (100 microradians) and accuracy is typically better than 10% of the distance traveled after calibration. Open-loop stepping creates motion using only the piezoelectric motor that is commanded to move in “sub-steps.” The magnitude of the sub-steps is smaller than the M3 module’s internal sensor resolution and allows more precise movement. The motor in the M3 module can be driven using open-loop commands from the SPI, I2C or UART interface. This is particularly useful in applications that have an external sensor with better resolution than the internal sensor, or where very fast “step and settle” performance is required. Motor sub-steps are commanded from the host processor by defining the Direction, Velocity, and On-time for the piezoelectric motor. The combination of Velocity and On-time determines the magnitude of each sub-step. a. Calibration of motor sub-step size for specific operation conditions using an external sensor and fixed look-up table. b. Real-time calibration using the internal sensor to measure the average size of multiple motor sub-steps. Contact us for more information about using M3 micromechatronic modules in your system.